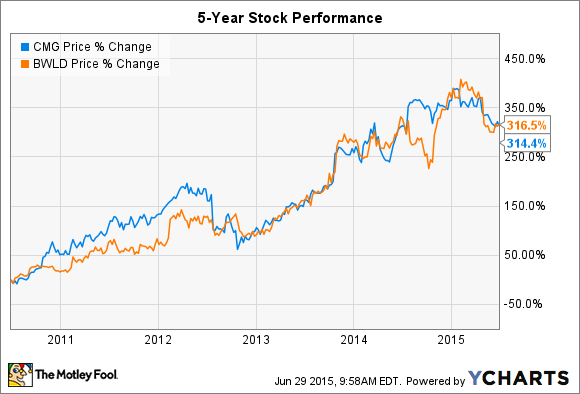 Better Restaurant Stock Buy: Chipotle Mexican Grill Inc. or Buffalo Wild Wings? Pitting the two successful restaurant chains against each other. Wings and beer, or burritos and chips? I'm not asking about your dinner plans so much as your investment preference. Chipotle (NYSE:CMG) and Buffalo Wild Wings (NASDAQ:BWLD) have different approaches to making money by serving food. But both strategies have been working equally well lately: The stocks are up 300% since 2010. Revenue and sales growth are based on the last complete fiscal year. Profit margin, P/E, and P/S ratios are over the past 12 months. Source: Company financial filings. Chipotle is on a mission to disrupt the fast-food industry, and founder Steve Ells thinks he has found a way to accomplish that aggressive aim. The approach involves bringing elements of fine dining -- including high-quality ingredients, classic cooking methods, and great customer service -- to the casual-dining experience. The strategy is working like a charm. Chipotle booked an incredible 17% jump in comparable-store sales last year. Better yet, only 4 percentage points of those gains came from higher menu prices, which shows Chipotle locations are capturing and processing much higher customer traffic volumes. In fact, annual revenue at a typical restaurant reached $2.4 million last year, up from $1.4 million when the burrito slinger went public in 2006. Expectations are for that awesome growth to continue, just not at 2014's breakneck pace. Wall Street sees Chipotle logging 16% higher sales when it posts second-quarter results in late July. At the same time, profitability should to be held back by the company's elevated food costs (they hit 34% of sales in the first quarter). Being a sports fan is expensive, and getting more so every year. NCAA basketball tournament tickets on average cost $344 across all games this past March, with Final Four seats averaging $1,400 a pop. And the total cost for an outing to a typical pro football game hit $120 per person last year, up 4% from 2013. Those jaw-dropping prices represent a major opportunity for Buffalo Wild Wings to become the preferred place for fans to watch their teams without shelling out hundreds of dollars. The key to winning over these people, management thinks, is for B-Dubs to deliver a unique experience to its diners. That's why the company has poured millions of dollars into upgrading its restaurants with a new "stadia" design. "We didn't set out to replicate a stadium experience," an executive explained, "but if you can't go to the stadium, you should be able to go to Buffalo Wild Wings and get similar energy." B-Dubs is also spending heavily on its employees, adding a new position at every restaurant that is charged with improving each guest's dining experience. These investments are already paying off as B-Dubs booked 7% comps growth last quarter. Customer satisfaction and loyalty scores are climbing to new highs, and steady chicken wing costs should pave the way for 18% higher earnings in 2015. Both companies expect huge growth over the next few years. B-Dubs' management anticipates eventually hitting 3,000 locations worldwide, up from 1,100 now. Chipotle is tacking 200 new stores per year onto its 1,800 restaurant base. Those impressive market opportunities are why investors are bidding up both stocks to expensive valuations: 32 times B-Dubs' earnings and 40 times Chipotle's. Still, I'm partial to a Chipotle investment at today's prices. The main reason is that I think its "food with integrity" approach can handle many more restaurants in the U.S. while also soon supporting a legitimate grab for a piece of the $2 trillion global fast-food industry. Yes, investors pay a hefty premium to own this stock. But they could be rewarded with much higher profits as Chipotle establishes itself as a global contender by 2020.